CHARDON, Ohio, March 1, 2012 (SEND2PRESS NEWSWIRE) — ERP business software solution provider and developer e2b teknologies (www.e2btek.com) is supporting three charities in recognition of Child Life Month which is March. Charitable activities and events include an annual sponsorship of two children through Save the Children Foundation, participation in the Big Brothers and Big Sisters Bowl for Kids Sake, and a recently completed Tackle The Tower fundraiser for the Ronald McDonald House charities. With millions hungry abroad and domestically, e2b teknologies is teaming up with Save the Children Foundation to help sponsor two children. Employees are collectively sponsoring a young boy domestically and the company is matching that by sponsoring a young girl in El Salvador. The cost to sponsor a child is only $28 per month. With nine out of every ten dollars of charitable donations going toward programs and services for children and families in desperate need, Save the Children ranks among the top nonprofits globally in using donations efficiently and effectively. On March 11, e2b teknologies will be participating in the 2012 Bowl for Kids Sake benefiting Big Brothers and Big Sisters of Northeast Ohio. As a Helping Hands sponsor for the event, e2b will field three teams – The Collect Crew, ERP Posse, and Calibration Lab Rats – raising over $1,000 for the children served by BBBS Northeast Ohio. In February, e2b teknologies sponsored employees Shaun Yerkic and Kate Mullen who participated in “Tackle the Tower” benefiting Ronald McDonald House charities. The event featured participants racing up 37 flights of stairs at the Tower of Erieview which is connected to the Galleria shopping mall in Cleveland. “I am proud of the work our team does for the businesses we serve, but it is equally rewarding to see the support and the enthusiasm our employees have for giving to those in need,” said Henslee. 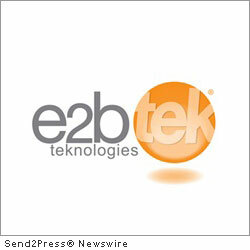 e2b teknologies (www.e2btek.com) provides ERP business software for distribution, manufacturing, and service companies. Anytime Collect (www.anytimecollect.com) accounts receivable collections software and e2b 500 supply chain management solutions are delivered through its e2b software division. e2b software (www.e2bsoft.com) also provides custom cloud business software development services. e2b calibration (www.e2bcal.com) provides test equipment calibration and repair services. News Source: e2b software :: This press release was issued on behalf of the news source by Send2Press® Newswire, a service of Neotrope®. View all current news at: http://Send2PressNewswire.com .